The tool comes with an alignment guide for 90-degree layout in which angles can be calculated and turned within 5-degree increments. Two bubble vials assist with the correct alignment of the laser level and the wall. The Bosch GTL2 laser square operates with one-button system powering the two beams on and off, making it very user-friendly for those without much technical knowledge. To fix it on a smooth surface, the Bosch laser tool comes with an easy-to-press push button and non-abrasive adhesive mounting strips. 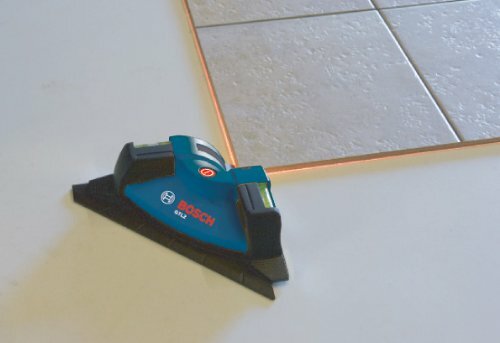 The device is renowned for its accuracy in surface leveling tasks, making it one of the best laser square for home remodeling projects such as tile cutting or installation, wall fixtures (like cabinets, shelves, or frames), and finish carpentry, among other applications (like wall decoration). It is not intended for bright light conditions and cannot be mounted on a tripod nor used for outdoor projects. 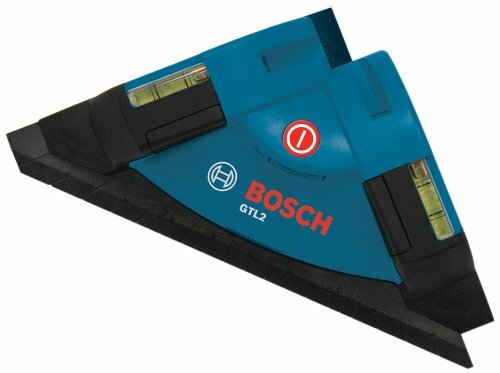 Some users of the Bosch GTL2 laser square note that the non-abrasive adhesive for attaching the device to walls wears out. The blue tacky putty comes as a sample to enable immediate use of the tool and, like most adhesives, needs to be replaced after several uses. Used for its intended tasks, there is no better price versus value laser level currently on the market. A major advantage of the Bosch GTL2 laser square is the facility of use and rapid set-up thanks to the one-button operation for the dual laser lines and the easy-to-press push button. A visual assessment of the product is often enough to inform even the inexperienced user on its functionality. The accuracy of this laser square tool and its durability, given the very affordable price, places it at the top of the market for the simple leveling projects for which it was designed.